The opening ceremony took place on the club’s beach overlooking the sea, with several hundred people present. The president of the club, Fran Ripoli thanked the organising team for two years of hard work, welcomed the competitors and then wished all participants good winds for the competition. 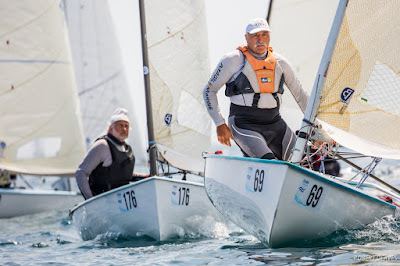 Next, Miguel Angel Mateo, the President of the Catalan Finn Association and José Maria van der Ploeg, the Spanish Finn Olympic gold medalist in 1992, also took to the stage to welcome all competitors to El Balís. Finally, the Finn Masters President, Andy Denison opened the championship. He began by remembering the Croatian Finn sailor, Luksa Cicarelli, who had entered the event but had passed away while training for the event earlier this year. Then he invited last year’s Finn Masters Champion, Vladimir Krutskikh to the stage to hand the trophy to the Sr. Ripoli for safekeeping until the closing ceremony next Friday. Then the event was officially opened by Mr Denison, as is tradition, by handing over the Finn Masters flag to Sr. Ripoll, which will fly over the club until the end of the event. Earlier in the day the practice race was attempted, but a fading wind meant all races were abandoned. The forecast for the coming week could present some challenges to the race committee with very light winds predicted for much of the week. Most of the training over the past week has been replaced by visits to bars and restaurants, as the wind has been extremely light for several days. However the weather pattern is beginning to change so everyone is hoping that the racing will not be too disrupted. But the sun has been shining and the temperatures rising, so it has been a pleasurable start to the event, despite the lack of sailing. Racing is scheduled to start at 12.00 Monday, with a series of seven races leading into Friday’s final race and medal race. The fleet of 352 sailors from 32 nations has been split into four groups, on two different course areas. The scale of the event is huge, with boats poked into almost every corner of the northern half on the marina at Port Balís. While the event is just four boats short of breaking the record attendance of 355, set in 2016, it has broken the record for the most Legends (45) and Super Legends (5), that have entered this year. They say "Once a Finn sailor, always a Finn sailor", to which we should perhaps add, "Long live the Finn and long live Finn sailors."